Harrisburg, PA – Governor Tom Wolf, Sen. Jake Corman, and Pennsylvania Department of Transportation officials were joined by local officials and stakeholders today to announce that efforts to connect the area of Seven Mountains to the greater State College area are restarting after being shelved for more than 15 years. 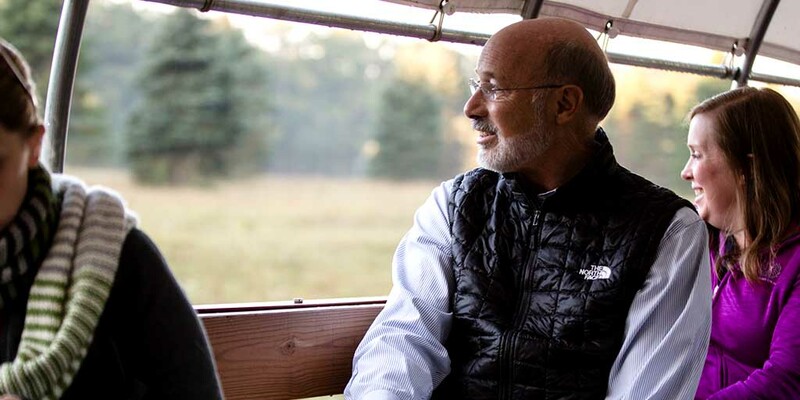 Governor Wolf announced that PennDOT is committing $5 million to begin preliminary engineering this year on this complex, significant project, and emphasized that community involvement will be a critical component of the project-development process. Given the extensive collaboration with local communities, businesses, and others through the design, utilities, and right-of-way phases, the department is also taking steps to align resources for a targeted 2027 construction start. Act 89 of 2013 made possible some significant improvements in the region but did not provide enough for this project, and the state continues to await federal action on meaningful transportation investment. In the absence of additional federal investments to allow more state-funding options, PennDOT has committed discretionary funding to make the project a reality without changing overall transportation project plans. The commitment follows action from the administration in 2017 when the department started a refresh of environmental, traffic, and safety data regarding commercial development and community needs for a corridor involving Route 322, Route 45, and Route 144 in south central Centre County. Preliminary data from that refresh shows that from 1999 to 2016, truck traffic has increased 37 percent. Additional information on the PMG project can be found at www.penndot.gov/PottersMillsGap. Subscribe to PennDOT news in Cameron, Centre, Clearfield, Clinton, Elk, Juniata, McKean, Mifflin, and Potter counties at www.penndot.gov/District2.